This blog decribes my cycling adventures in the Alps. I'm happiest when climbing all sorts of mountain roads on one of my three bicycles (MTB, racer or trekking bike). 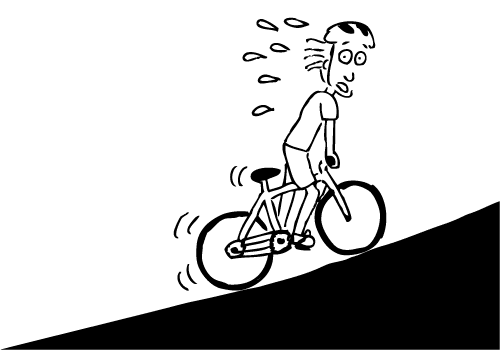 Since last year I always wanted to test my legs on the short but steep ascent to the center of Mt. Saleve which is the closest mountain to Geneva. On a sunny afternoon I decided therefore to give it a try and headed by car to Collonges sous Saleve with the MTB on the roof. From the center of the village the road immediately climbs and leads to the small neighboring village of Le Coin from where the real climb starts. The road was in pretty good shape with only a few holes and I advanced rather fast. The hairpins are wonderful and the few cars didn't disturb me much. In less that an hour I made it to the first col, Col de la Croisette at the junction of the two roads which join at a village with the same name in about the center of that table mountain. From there the view towards the Alps is breathtaking but instead of a break I decided to immediately continue towards my final destination, Col de Pitons towards the western end of Saleve mountain, where I arrived about 20min. later. After taking a few photos I returned to Croisette for a coffee break before rolling back down to Collonges. Design "Einfach". Designbilder von zbindere. Powered by Blogger.